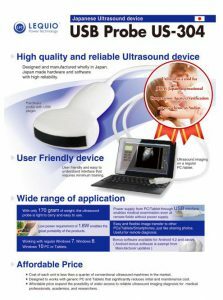 We released the diagnostic ultrasound imaging device US-304. US-304 was developed as a beginning of the voice and the strong request from the medical field of Africa, and focusing mainly in developing countries overseas. It overturn the common sense of the conventional system in the product concept intended for use in the medical front line that are not well-equipped power supply environment, and has the following features. -USB connection to Windows PC, running on a battery of PC. -Viewer software runs on the PC, provides a simple and fully function and enough resolution. -In the assumed design to network connection,support the telemedicine. We are ope to individual support plan for NPOs,NGOs, medical institutions that mission various contribution activities overseas.